The Visionary Adapter L is a fully universal digiscoping adapter. This means it will work with pretty much all digital cameras and spotting scopes and offers massive amounts of adjustability.The L adapter is strong and sturdy. The adapter has a standard tripod fitting to attach to your tripod head. The scope then attaches to the adapter (see opposite). The whole set-up feels very stable once connected.The adapter is very versatile, and offers full height, depth and camera angle adjustability allowing you to achieve an extremely accurate alignment between your scope and camera. The adapter works with both straight and angled spotting scopes.One huge bonus to this design of adapter is that you can rotate your camera away from the eyepiece without having to dismantle or remove equipment. You can simply swing the camera in and out of position to alternate between viewing and photography.Fully adjustable all ways for any scope, any eyepiece, any camera. The Visionary Adapter S offers a quick and easy way to connect a compact digital camera to a spotting scope. Attaching this adapter to your scope takes very little time. It simply clamps around the telescope eyepiece. 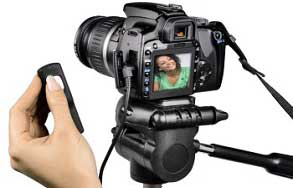 The clamp is adjustable and this adapter fits most scopes with narrow & wide eyepieces.Your camera screws onto the adapter via the cameras tripod socket. 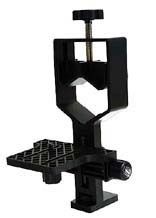 The adapter allows depth and height adjustments to suit most digital compact cameras. A few minutes of time is normally all that is required to align your camera to the spotting scope by adjusting the height and depth threads. Your scope remains attached to your tripod as normal and the adapter can be quickly removed. Using this adapter may restrict the zoom facility of your telescopes eyepiece.The adapter works with both straight and angled spotting scopes. The MicroStage 6030 is a Digital Camera Adapter designed to work with 31.7mm and 50.8mm eyepieces. 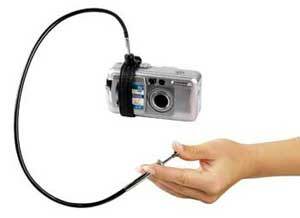 Fits almost all compact digital cameras that have a photo tripod adaptor in the base. It has an X,Y-stage connected to a clamp that fastens around each eyepiece from 28 mm up to 65 mm diameter. Works with Spotting Scopes and Microscopes as well as telescopes. 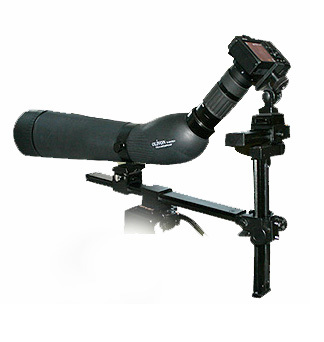 The Baader MicroStage II enables camera adaption onto almost any telescope, spotting scope and many binoculars. The camera support arm moves to the side (with clickstop action) for visual aiming. Camera remains completely adjusted and ready for shooting the image when the support arm is 'clicked' back into place. - Folding design, requires almost no storage space in your accessory case. 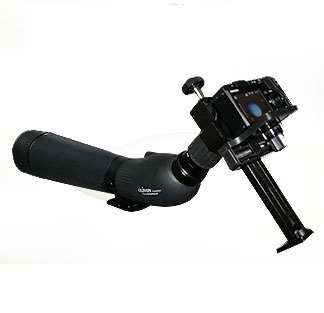 Enables camera adaption onto almost any telescope, spotting scope and many binoculars. The camera support arm moves to the side for visual aiming. Camera remains completely adjusted and ready for shooting the image when the support arm is rotated back into place. These cables allow images to be taken with out the need to directly press the shutter release button thus reducing the chances of shake. They are lockable for long exposures (bulb).